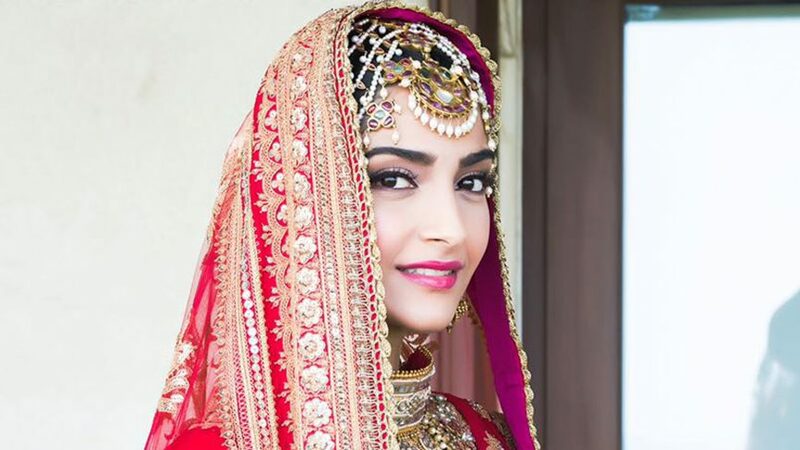 While I think a lot of us had gone crazy looking for that hatke colour for our wedding, Sonam just reminded how to look like the perfect Indian Bride in bold red and gold. Her look was simple, classic and an instant love. For me, her elaborate gold border just stole the show. The intricate detailing on that border looks so rich. Am I only one who thinks she looks pretty Kashmiri bride in her close up shot with that maang tikka and head jewellery piece? The theme of the function was white, and Sonam looked every bit of a radiant happy bride to be. The minimal jewellery and the beautiful floral hairstyle all trends for this year. So many things to note down from her bridal taste. Minimal goes a long way to ensure classy look. Is that a Cannes red carpet outfit or a reception outfit? I’ll take it in either case. What a stunner! If there is one thing Sonam knows, its how to dress. The reception outfit was a one of a kind geometric patterned lehenga with a gorgeous cape jacket style dupatta. Now, all we have got to do is wait for real brides to experiment around this look for their wedding. What say? What do you think of all her bridal looks? I think her main wedding day red bridal lehenga topped my list? What was your favourite? Oho, cannot get enough of these two. They look so adorable and in love. Stay blessed guys. Seen on Anand Ahuja’s Instagram.